This easy tutorial shows you How to Make Spider Cupcakes. 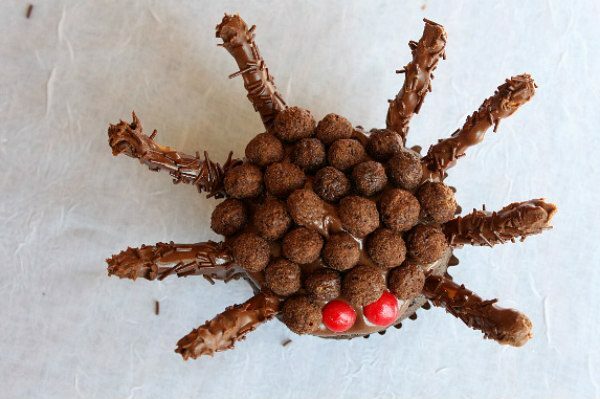 Chocolate Nutella Spider Cupcakes are a super easy, fun recipe to make for Halloween. No one likes spiders, but these spider cupcakes make spiders look kind of cute! These spider cupcakes are so easy to make. And they’re super kid friendly and not scary at all for a Halloween party. These cupcakes are fun to make with your kids too! Making spider cupcakes couldn’t be much easier! Start with prepared chocolate cupcakes. 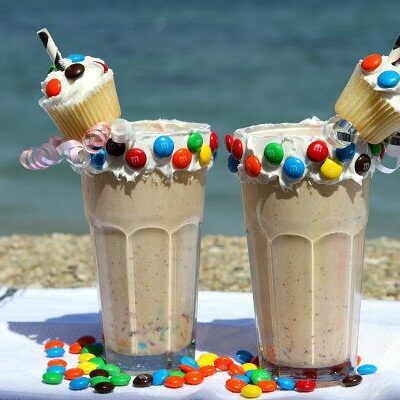 You can use a boxed mix or bake them homemade. I don’t think it really makes much different with kids. They are not likely to notice any difference between a box or from scratch! 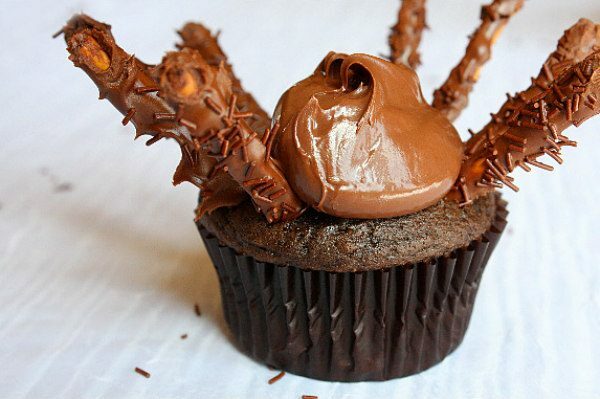 The legs of your chocolate spider cupcakes will be made out of pretzels. You’ll cover the pretzels with quick-drying chocolate Magic Shell (near the hot fudge at your market), and then quickly add some brown sprinkles to simulate furry spider legs! This is kind of a laborious process if you’re making a ton of spider cupcakes, but it’s one that I’m sure the kids would be happy to help you out on! 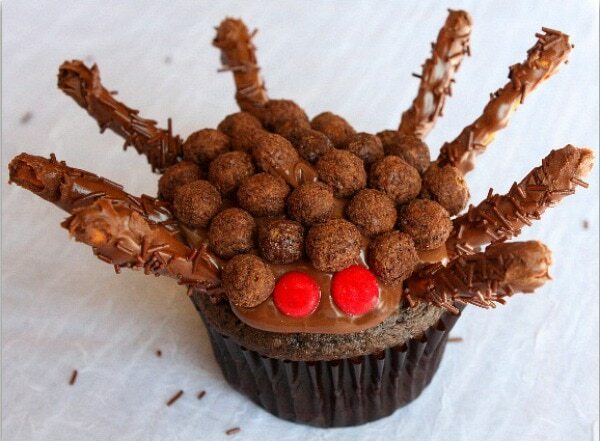 Because it’s a spider, you’ll poke four legs on each side of your cupcake to create eight legs. 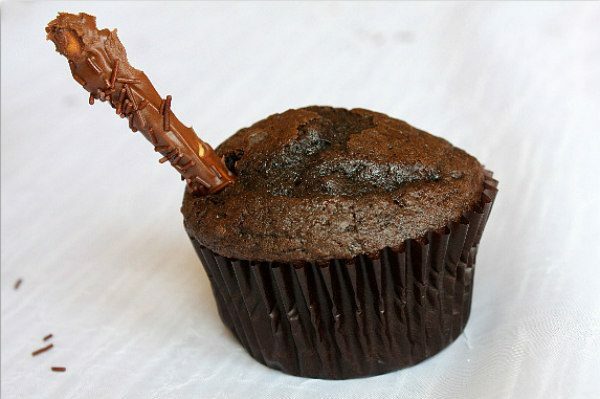 A spoonful of Nutella goes on top to act as the frosting for the cupcake. 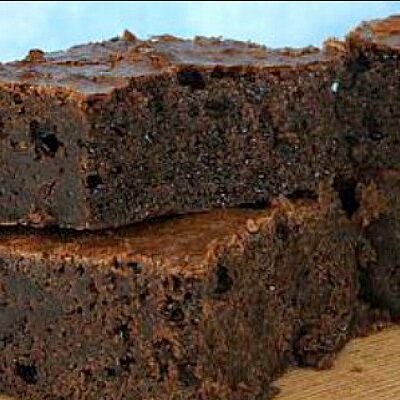 You can certainly use regular chocolate frosting here- either the tub frosting at the store or homemade chocolate frosting. Creepy spiders generally have creepy eyes too. Cinnamon Red Hot candies are the perfect eyes for these Spider Cupcakes! Cocoa Puffs cereal goes on top of these cupcakes to finish them off. 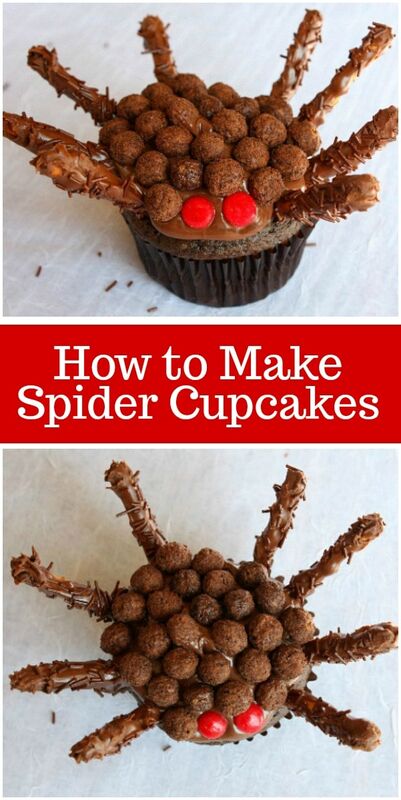 Now you know how to make spider cupcakes. The kids will love them! If you’re looking for more kid friendly Halloween recipes, you might also enjoy my Mummy Cookie Pops and these Spider Web Eggs. Halloween Pretzels, Chocolate Chip Spider Cookies, and Eyeball Truffles are fun Halloween recipes too! These chocolate cupcakes are turned into spiders with the addition of Nutella frosting and chocolate sprinkled pretzel legs! Red hot cinnamon candies make the spider eyes. Place a cookie cooling rack over paper towels. Lay out pretzels onto the rack. Drizzle Magic Shell over and quickly sprinkle with the chocolate sprinkles (before it dries!). Let dry on cooling rack. 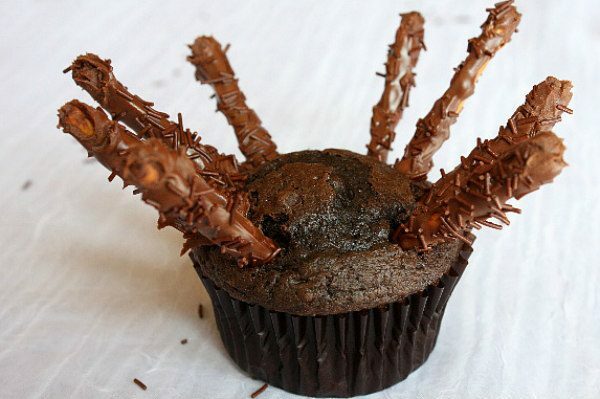 You'll need 8 spider legs for each spider cupcake that you make. Gently insert spider legs (4 on each side) into the top-sides of the cupcakes. Spoon about 1/2 tablespoon of the Nutella onto the top of the cupcake (to act as frosting). 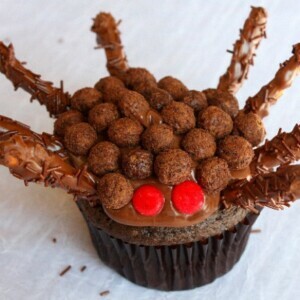 On top of the spread, add 2 red hots for the eyes of the spider; dot Cocoa Puffs onto the body of the spider. Eat! 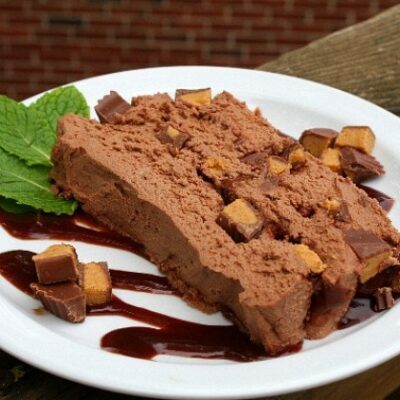 Money-saving tip: Use canned chocolate frosting in place of the chocolate hazelnut spread. 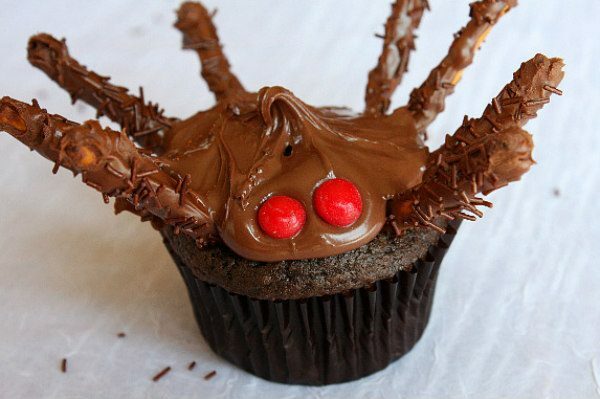 Make ahead tip: You can make these spider cupcakes one day ahead & they will be perfectly fine to eat the next day. So fantastic, Lori! 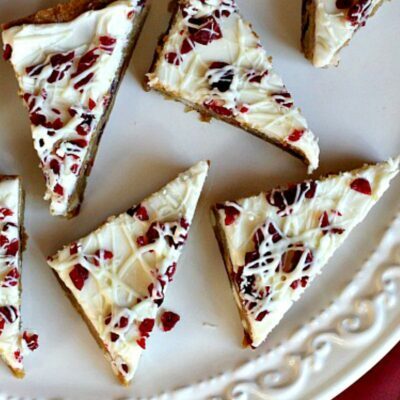 Saw you on BettyCrocker.com today and just HAD to tell you THANKS for posting such a FUN (and tasty) Halloween recipe idea. I sure do love Recipe Girl!